Scientific evidence accumulated over decades validates the idea that a plant-based dietary pattern, such as the traditional Mediterranean way of eating, promotes health and plays an important role in risk reduction and prevention of several chronic diseases. One of the great advantages of the Mediterranean diet is that it can be easily adopted by other cultures because it is flexible and highly palatable. The Mediterranean Way of Eating: Evidence for Chronic Disease Prevention and Weight Management offers evidence-based information about an enjoyable, healthy way of eating that has stood the test of time, along with practical suggestions for incorporating the Mediterranean diet into your daily life. The first part of the book provides a brief history of the Mediterranean region and its different dietary influences. It discusses shared and unique foods in the coastal regions, and recent influences of processed foods and fast foods. It also presents scientific information on critical nutrients (macronutrients, vitamins, minerals, phytochemicals, antioxidants, and fiber) in foods found in the Mediterranean diets, how they function in the body, and why they are essential to health. The authors review the major chronic diseases, including obesity, type 2 diabetes, cardiovascular diseases, and certain cancers, and examine how a Mediterranean-style diet may help reduce risk or prevent these diseases. The second part of the book addresses the protective effects of foods and food components, discussing how Mediterranean diets may confer health benefits for reducing disease risk and managing weight. It examines the evidence-based health benefits for each of the food groups—such as fruits, vegetables, grains, fish, meat, dairy products, plus alcohol—along with suggestions for using the foods as part of a healthy diet. The last part of the book focuses on how to move toward a Mediterranean-style diet in your own life, eating at home or dining out, offering effective strategies for implementing the dietary changes. 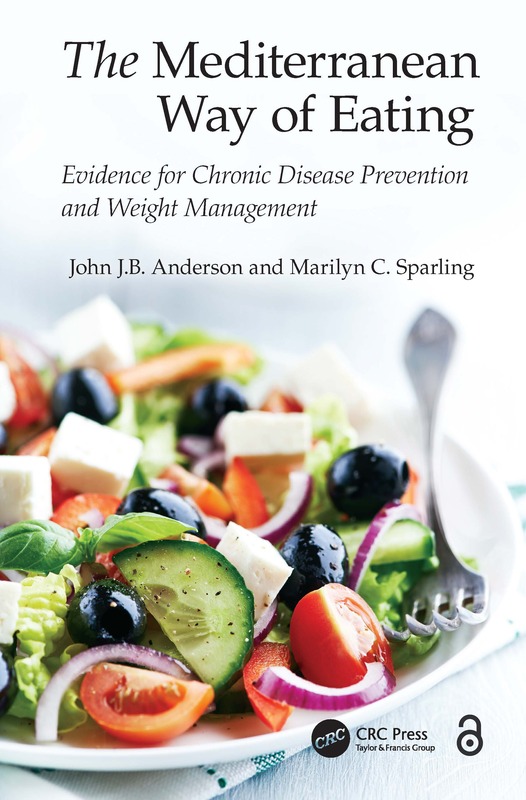 "… this is a timely book … Medical professionals, however, could benefit from its lengthy list of research and other articles about this diet." John J. B. Anderson, BA, MAT, MA, PhD, has been on the faculty of the Department of Nutrition in the Gillings School of Global Public Health at The University of North Carolina at Chapel Hill since 1972. He has a bachelor’s degree in history from Williams College, a master’s degree in education from Harvard University, a master’s degree in biology from Boston University, and a doctorate in physical biology (biochemistry) from Cornell University, Ithaca, New York. His research career has centered on the linkages among nutrients, hormones, lifestyle factors, and bone health. He has published several books and written approximately 150 scientific articles. He is currently on the editorial boards of several journals, including the British Journal of Nutrition, Journal of Bone and Mineral Research, Osteoporosis International, and Nutrition Research. Marilyn C. Sparling, BS, MA, MPH, RD , LDN, is a registered and licensed dietitian recently retired from Duke University Medical Center in Durham, North Carolina, where she was a clinical dietitian in the outpatient endocrinology division. She graduated from The University of North Carolina at Chapel Hill with a master’s degree in public health, focusing on nutrition. She is a long-time professional member of the Academy of Nutrition and Dietetics and the American Diabetes Association. She has coauthored several journal articles on nutrition and health. During her tenure at Duke, she became a certified diabetes educator (CDE), worked as a member of a multidisciplinary medical care team, and provided nutrition education and counseling in osteoporosis, diabetes, lipid disorders, and other chronic medical conditions.